Earlier this year I wrote a review of Yumi Sakugawa’s Your Illustrated Guide To Becoming One With The Universe, which is a charming and profound comic that helps the reader meditate on and contemplate life. I also reviewed Martin Laird’s Into the Silent Land and compared that book to The Matrix for thoughtful Christians. Keeping in the same neighborhood of meditative searchers, I’m reviewing The Way of the Mystics. I picked this one up at Half-Price Books a decade ago, but it never felt like the right time to read it until now. Sometimes, you just have to wait. 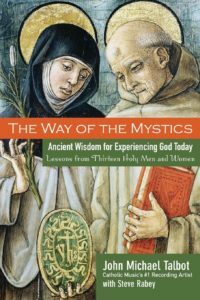 Using the stories of thirteen male and female mystics, Talbot explores mystical practices and mindsets that have consistently brought people closer to God. In addition to providing historical and spiritual context for each mentioned person, the author also provides a helpful reading list in case the reader wants to further explore a person of interest. For that reason, this book is probably best as a starting point for deeper study rather than as a study or study guide itself. I very happily turned the last blank page of the book into a place to keep notes on other original books and biographies I wanted to buy, and that easily filled a whole sheet of paper. Share the post "A Starting Point for Christian Mysticism"